Mozart mingling with coquis, violinist Veronica Pellegrini and Lilliana Marrero Solís as another, Luis Miguel Rojas on the violoncello, and Rosa Sierra on the viola. Like many of the ingredients in the meal, the table decorations also came from the property. You can see Renée picking Hibiscus in the background. And what a lovely view for a dinner party! I was lucky enough to be part of one of these special dinner parties, which was made even more special by the fact that four incredibly-talented musicians played string instruments throughout the meal, and one gifted writer read a poem during “intermission.” As the tuning of string instruments mixed with the sounds of the jungle at dusk, I felt chills. And the poem, a blend of refined genius and humor, was a perfect interlude. Musically-endowed friends of Renée and Bill were key to making this evening possible. Veronica Pellegrini, one of the two violinists who played, actually came to Rainforest Inn first as a volunteer, via Craigslist, about twelve years ago. She has since returned various times, to visit as a guest, because she loves the property and people so much. Veronica arranged the music that was played, as well as organizing the musicians in attendance and coordinating the impromptu date with Renée. Front row seats for a top-rate performance. The quartet included Veronica as one violinist and Lilliana Marrero Solís as another, Luis Miguel Rojas on the violoncello, and Rosa Sierra on the viola (in order from left to right in the above image). Reisaac Colón, Veronica’s husband, acted as the “presenter” throughout the meal, explaining what pieces would be played. He too plays the cello and will likely play at the Inn sometime soon, so that is something to look forward to. Reisaac also introduced Robert Egan, the writer who read a poem for us. Robert Egan reads his poem while Renée listens from the kitchen. Robert was here with violinist Lilliana, as he wanted to see the vistas and views offered by the Rainforest Inn, as well as enjoy Renée’s incredible cooking. Once he saw the friendly faces of guests and neighbors alike, Robert asked Lillana if she could see if we would like him to read us one of his poems, to which we all responded enthusiastically: Yes! We were so happy to have another impromptu addition to the evening. It was all quite sophisticated, with bottles of Malbecs and California whites constantly being uncorked to sustain us through four courses of food. Renée began the meal with a curried local squash soup (sopa de calabasa). Between its striking color and velvety, warm texture, one guest remarked “this is incredible” between bites. Attention to detail is one of Renée’s specialities, obvious from the dash of fresh-cracked pepper topping the soup and the eclectic, inviting place settings. Renée’s micro-greens often make appearances on Instagram as well as on guests’ plates! Then came a light, pallet-cleansing beet and citrus salad, sprinkled with toasted pine nuts for another texture. A satisfying, acidic vinaigrette coated each bite, with a few of Renée’s cultivated micro-greens (pea shoots) added as a finishing garnish. The main course, a pesto-coated fillet of salmon for those who eat fish and a pecan-mushroom loaf for those who do not, accompanied by perfectly roasted rosemary potatoes and asparagus, was enjoyed by us all as the musicians finished their set. Now chorused by the coquís and our own conversation, we had a flourless chocolate cake for dessert, topped with a scoop of homemade ginger ice cream and a beautiful nasturtium edible flower. Bill made those who wanted one a cappuccino with his finest coffee. My stomach is growling as I think about it. This dessert was a HUGE hit! Amazingly, this dinner came together in the matter of a few days, and was not Renée’s first time organizing a gourmet “pop-up” meal for guests. In the past, the Inn has hosted other gatherings in the same vein, such as a twenty-guest murder mystery themed dinner party. For this, Renée likewise prepared everything, plus she acted one of the parts (she didn’t know until the end, but she was the murderer). While guests of Rainforest Inn can always expect a luxurious vegetarian or vegan breakfast, they can also look forward to the potential of participating in other impromptu events on the property, which often involve trying more of Renée’s superb cooking. 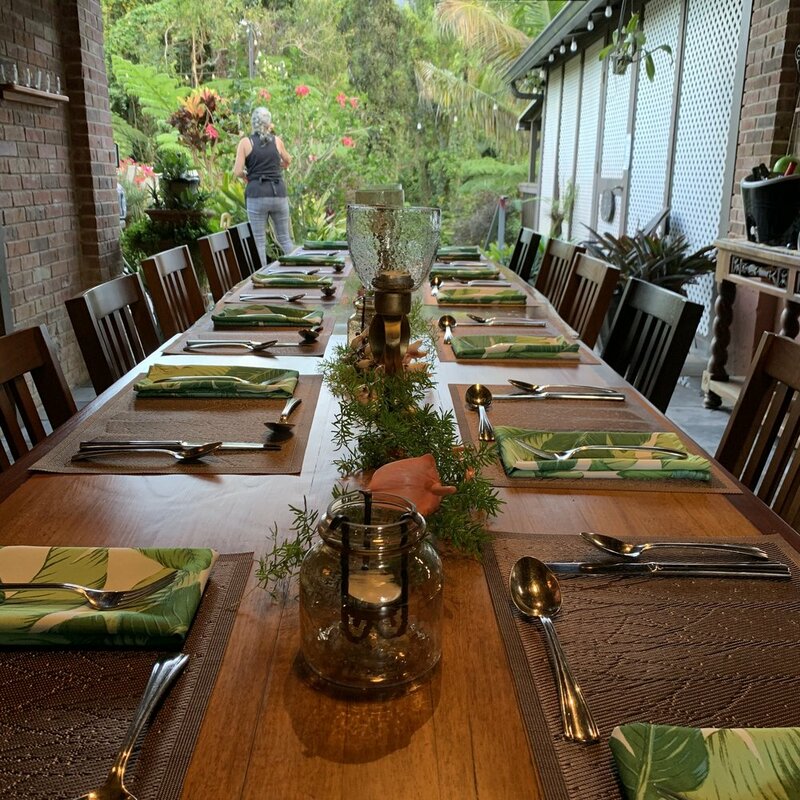 They love working with people in the surrounding community, their friends, and also their guests, to arrange special occasions like this luxe dinner party that makes their - and our - time in Puerto Rico all the more enriching. Cheers! Conversation flourishes between people who were previously strangers, accompanied by the lovely string quartet. Mint for the water, rosemary for the potatoes, and edible flowers for dessert. And they all came right off the Inn’s property! Colorful food is important! So is eating your veggies! Uncorking some nice bottles of wine in good company always makes for a special evening. The table decorations made it all feel a little more Caribbean, and they also came straight from plants around the property. The quartet plays away as the first course is served. Great company, great music, great food! Newer PostNo Beach Bar, No Problem!